Double Sided Transparent Tape features a special adhesive that will hold paper securely, but also allows it to be easily removed or repositioned. Perfect to use for temporary posting of papers, packaging displays, layouts, or art projects. 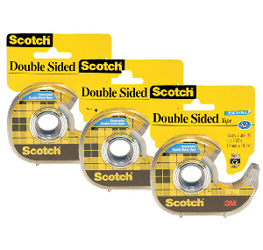 The 3m scotch double sided tape features a special adhesive that will hold paper securely, but also allows it to be easily removed or repositioned. Perfect to use for temporary posting of papers, packaging displays, layouts, or art projects.